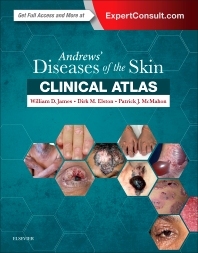 Includes 3,000 high-quality color images depicting the complete spectrum of skin diseases　in all skin types across adults, children and newborns. Highlights a wide variety of subtypes of common conditions such as lichen planus, granuloma annulare, and psoriasis. Relevant hair, nail, and mucous membrane findings are featured. Includes representations of important systemic conditions such as sarcoidosis, lupus erythematosus and infectious diseases. Features never-before-published images contributed by 54 global leaders in dermatology. Concise introductory text for each chapter gives readers a quick overview and understanding. Table of Contents is aligned with Andrews’ Diseases of the Skin, allowing both books to be used in tandem.